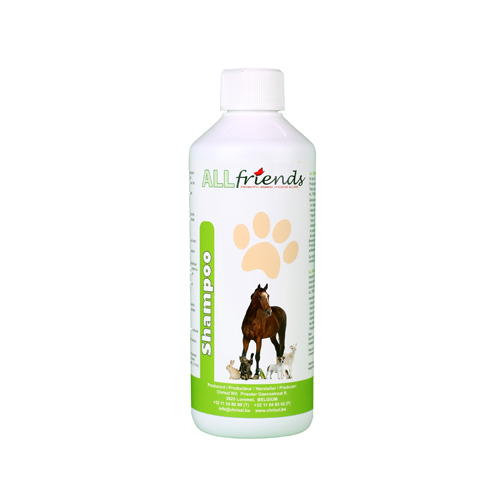 All Friends Animal Shampoo from Chrisal is a probiotic shampoo for animals. It has a pure non-allergenic and fragrance-free formula for skin, coat and fur. All Friends Animal Shampoo from Chrisal is a probiotic shampoo for animals. It has a pure non-allergenic and fragrance-free formula for skin, coat and fur. The shampoo is 100% safe for animals and humans. A healthy coat or fur is very important for the general health of animals. When the fur is dirty or unkempt, it can cause skin problems, allergies or odours. The probiotics in All Friends Animal Shampoo actively remove dirt and allergens in the coat of the animal, keeping it clean and healthy. This will make the animal more comfortable and prevent bad odours. Many animals suffer from skin problems or allergies. The skin or fur is often a repository of dirt, allergens or harmful micro-organisms. Chrisal have developed this probiotic shampoo to keep the fur or coat as pure as possible. This is not only beneficial for the animal itself, but also for people who are allergic to certain substances in the fur/coat. The probiotics are 100% natural and actively contribute to maintaining the environment. Shake the All Friends Animal Shampoo well before use. Wet the coat of the animal with lukewarm water, then apply the shampoo on the back and lather the entire coat for several minutes. Finally, rinse the shampoo with lukewarm water. Keep the All Friends Animal Shampoo between 5ºC and 40ºC, away from direct sunlight and out of reach of children. Have you used All Friends Animal Shampoo before? Let us know what you think about this product.